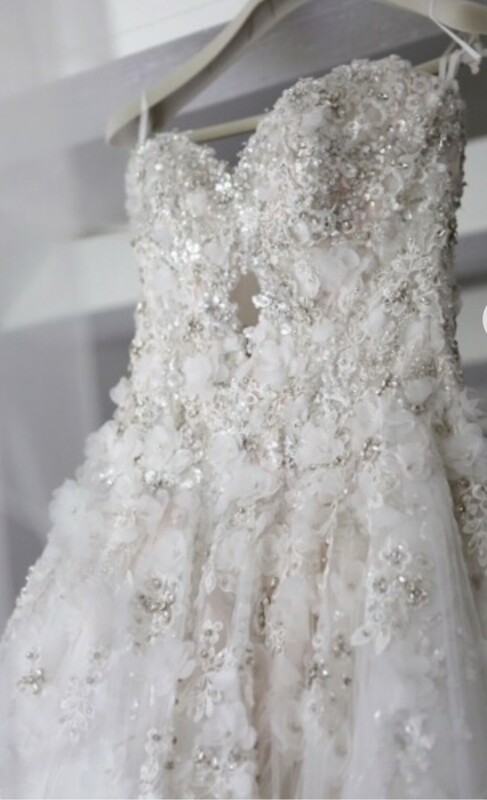 Stunning intricate YSA Makino gown. A corseted bodice with a plunging sweetheart neckline with a sheer tulle insert with a princess skirt made up of layers and layers of tulle. The bottom layers of the skirt showcase beautiful embroidered blush pink florals and then layered on top is an embroidered tulle. The dress comes with a matching trailing veil (shown in picture 5) with a approximate train of 5 feet. The veil is a beautiful plain ivory with matching embroidery on the trimming. The dress also consists of a tulle underskirt which accentuates the beautiful waisted silhouette. The pictures show me on the day wearing this gown - I am 5’7” and a UK size 8-10. I was wearing 3.5” heels on the day. Every person who sees this dress says that they have never seen such a beautiful and exquisite gown. It is very exclusive and hard to find even online. There is some staining on the bottom of the dress simply due to brushing on the ground on the day. I had an evening gown and thus the dress has only been worn for a maximum of 6 hours. I have had it looked at by professional dry cleaners whom suggested selling it as is and the buyer can choose whether they may wish to have it taken up through alterations (which may be required) or they simply suggested the bottom of the dress being dipped in a bathtub with some Vanish as the staining is minimal. The total cost for the dress, veil and underskirt was £9500 in 2018. I am looking for offers in the region of £3750-£4000.